What is the difference between “hard” and “soft” blackjack hands? The difference between a “hard” and “soft” hand in blackjack is one single card. The difference between a “hard” and “soft” hand in blackjack is one single card. The Ace. If one of the two cards you’re dealt is an Ace, you have a “soft” hand. Why? An Ace card can either be a 1 or an 11 which means that you have quite a bit of liquidity as far as what you can play based on the card the dealer holds. It really is interesting to see how one single card can make such a big difference. Want to try your hand at blackjack? 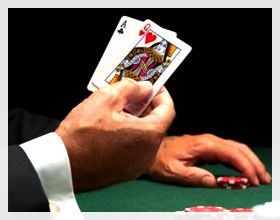 Check out the great table games available on Palace of Chance. An activist at heart, Claire has traveled the world using the cheapest methods possible, she has loved every minute of it. Due to her love for traveling she decided she needed a job where she could be free to do what she loves and still make money. In her family there are a few poker players and she picked up the love for the game since she was really young. Why are online casino programs so much better than live programs? Why are Card Tables Green? Do Sic Bo Strategies actually work? Are there Slots with No Paylines? Over 130 online slots to spin 'till you win! The top online casino to download, win and enjoy! If you can't find email with "Your Palace of Chance Password Reset Instructions" subject, check your spam or junk mail folder. Please note that email is usually delivered within 5 minutes.